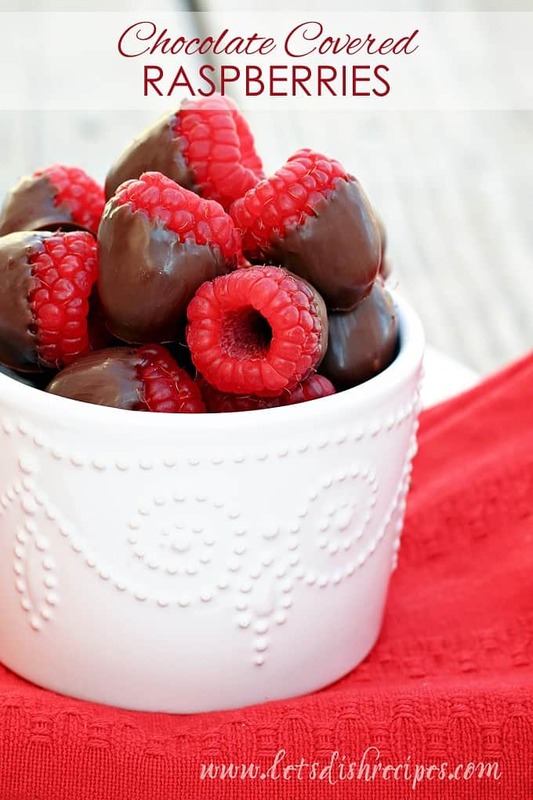 CHOCOLATE COVERED RASPBERRIES — Fresh raspberries are covered in dark chocolate for a decadent yet healthy treat. It seems that chocolate covered strawberries get all the attention when Valentine’s Day rolls around. 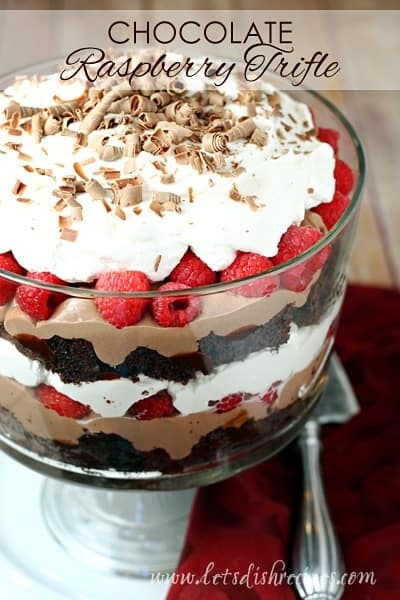 But if I had to choose, I’d say raspberries and chocolate are my favorite dessert combination. So why not Chocolate Covered Raspberries? Don’t get me wrong. I love chocolate covered strawberries. They’re beautiful and delicious. But oh my goodness! I honestly can’t believe I haven’t thought to do this sooner. These chocolate covered raspberries were amazing! You’ll want to use the largest, most firm berries you can find, just because they’ll be easier to dip. But these little chocolate raspberry morsels couldn’t have been any easier to make. If you’re looking for a healthier way to satisfy a sweet tooth, I highly recommend these Chocolate Covered Raspberries. 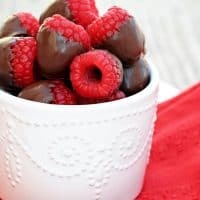 Be sure to save this recipe for Chocolate Covered Raspberries to your favorite Pinterest board for later. 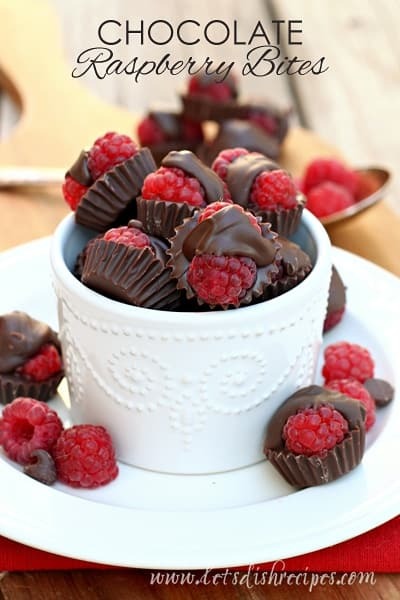 Fresh raspberries are covered in dark chocolate for a decadent yet healthy treat. Wash raspberries and pat dry thoroughly with paper towels. In a microwave safe bowl, heat chocolate at 50% power for 1 minute. Stir. Repeat at 30 seconds intervals until chocolate is completely melted. Carefully dip the bottom 2/3 of each raspberry into the chocolate, leaving the top of the raspberry exposed. Set dipped raspberries on a wax paper lined baking sheet. Refrigerate until serving. Great idea Danelle, these look incredible! These are so pretty! I love chocolate dipped strawberries and I’m sure I’d love these! So easy yet so delicious! totally want to have this instead of chocolate covered strawberries. YUM! i’ve made something similar before. they are delish! I love this idea, so simple, but so luscious! This is a good idea! I love raspberries, too! I’ve had these at a party and they’re addicting!! Want to do this for my own holiday celebration. I have one question though. Because of time constraints, I would like to make these the night before. How long would you suggest to have them in refrigerator? I don’t want to leave them in too long and they harden. Make sense? It should be fine to do the night before. Just take them out of the fridge 30 minutes or so before serving so they come back to room temperature. The only issue might be the raspberries going soft. They tend to do that more quickly once they’ve been washed…..but I still think it would work okay.